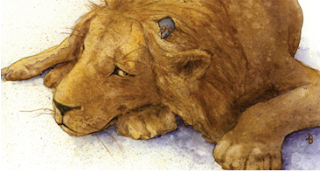 SCBWI Regional Advisors Win Marketing Grants and Work Of Outstanding Promise Awards! As a member of SCBWI, you have access to an incredible network of local volunteers throughout the world who are dedicated to the advancement of children's literature, and to helping other writers and illustrators advance in their own career journeys as well! Currently, there are 50 SCBWI regions in the USA and 30 international regions. Each of these regions is directed by a Regional Advisor (RA) or two Co-Regional Advisors. 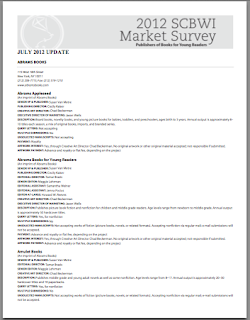 In addition, most of the larger regions have an Assistant Regional Advisor (ARA), Illustrator Coordinator (IC), and advisory board, to insure a full slate of regional events. Around the world, these professionals volunteer their time (and I can share from experience that it is a part-to-full time job!) to create the vibrant community that is the SCBWI. They organize book launch parties, critique groups, illustrator exhibits, workshops, retreats, critiquenics (a picnic/critiquing party combination), open studio days, schmoozes (informal get-togethers) and many other events to bring together like-minded authors and illustrators. The Regional Advisor Marketing Grant Winner and a $2,000 award goes to Kristi Valiant, Regional Advisor since 2012 for Indiana, for her picture book due out from Random House, PENGUIN CHA-CHA. I'll be using the grant to help create a book launch for PENGUIN CHA-CHA with silly props from the book and a cha-cha lesson, a blog tour, a teacher's guide, and school visits and dancing events for kids that encourage fun exercise. SCBWI has had a huge hand in helping me every step of the way with this picture book, from developing my illustrations for trade books to critiquing my many versions of this story to connecting me with my agent, Linda Pratt. And now, SCBWI is even helping with marketing. What a truly generous group of friends! It's a joy to serve as Indiana's Regional Advisor and an extreme honor to receive this grant. I'm still dancing on clouds! Thank you, SCBWI, for the encouragement and support. PENGUIN CHA-CHA is scheduled for publication in fall 2013 from Random House. I've illustrated other books, but this will be my first picture book that I both wrote and illustrated. In PENGUIN CHA-CHA, a group of penguins become fascinated by the dancers who perform at their zoo. Soon the typical penguin shuffle turns into a dance-floor extravaganza. And when Julia, a curious little girl, stumbles upon the penguins and their new hobby, she is determined to join their jazzy jitterbug. The only problem is that the penguins won’t dance with anyone else around. 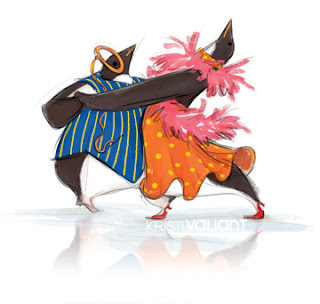 Julia finds a way to move and groove, whirl and twirl, and hip hop and boogie bop with those sneaky, dancing penguins. 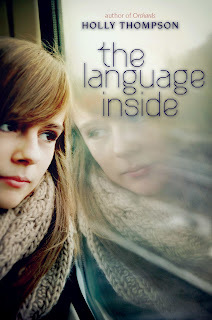 A special RAM Grant Honor Book and a $1,000 award goes to Holly Thompson, Regional Advisor for SCBWI Tokyo since 2005, for her YA verse novel, THE LANGUAGE INSIDE, published by Delacorte. Holly plans to use the money to promote worldwide awareness of the Cambodian culture. I was so pleased to receive the SCBWI RAM Honor Grant for marketing my novel THE LANGUAGE INSIDE (Delacorte/Random House, May 2013). THE LANGUAGE INSIDE features both Japanese and Cambodian culture and is set in Massachusetts in and around Lowell, home to the second largest Cambodian-American community in the U.S. One of my aims is to hold a launch reading in conjunction with a performance by the Angkor Dance Troupe of Lowell, members of which helped me research and hone my novel's story. I also aim to use the grant to help me prepare for international and U.S. school visits--conducting more research, taking more photographs in Lowell and in Cambodia, and studying the Khmer language--so that I can better raise awareness of Cambodian culture. I also hope to offer low-cost author visits at Massachusetts schools with significant Asian and/or ESL/EAL populations. Writing my RAM grant proposal was the perfect exercise, forcing me to think ahead a year and to plan what I hope are some dynamic service-oriented activities. Emma Karas was raised in Japan; it’s the country she calls home. But when her mother is diagnosed with breast cancer, Emma’s family moves to a town outside Lowell, Massachusetts to stay with her grandmother while her mom undergoes treatment. Emma feels out of place in the United States, begins to have migraines, and longs to be back in Japan. At her grandmother’s urging she volunteers at a long-term care center to help Zena, a patient with locked-in syndrome, write down her poems. There, Emma meets Samnang, another volunteer who assists elderly Cambodian refugees. Weekly visits to the care center, Zena’s poems, dance, and noodle soup bring Emma and Samnang closer until Emma must make a painful choice: stay in Massachusetts or return early to Japan. THE LANGUAGE INSIDE is a YA verse novel rich in language both spoken and unspoken and poetry that crosses boundaries. WOOP – Work Of Outstanding Promise by an R.A., A.R.A or I.C. The WOOP Grant Winner and $2,000 award goes to Genetta Adair, Regional Advisor for the Midsouth Region (Kentucky and Tennessee) for her novel THE VANISHINGS, a story about the poor who live and work in the massive toxic dump of Guatemala City. Genetta will use the money to travel to Guatemala to experience in person what she is writing about. I am humbled, honored, and thrilled to receive this grant! I look forward to traveling to Guatemala to complete the research needed to give my manuscript authenticity. I'm grateful to SCBWI for this award and for always supporting the RAs, ARAs, and ICs. SCBWI is the best! I've enjoyed serving the SCBWI members of the Midsouth (KY/TN) since 2009 as regional advisor and since 2006 when I began working on the Midsouth conference committee. I've loved getting to know the people of the Midsouth and also working with them to offer events that inspire, inform, and edify. I've been involved in other writing organizations in the past but never felt the love and encouragement that SCBWI fosters in its members for one another. This is the most wonderful writing organization ever! But more than that, SCBWI is an amazing family. A special WOOP Honor Book and a $1,000 award goes to Quinette Cook, Minnesota Regional Advisor, for her novel in verse, GILT, the story of a teen living out of her parents van and trying to keep her family together. Quinette will use the money to pay down student loans and pursue additional writing workshops. GILT is the story of a teen living out of her parent’s van. Danny will do whatever it takes to keep her family together and her little sister safe – even steal from churches. I knew that I would write this story, based on a 2004 news article, long before I discovered novels in verse. This piece was my creative thesis at Hamline University and I want to thank Ron Koertge for his ongoing support and for daring me to “jump in” and swim. In addition, I can’t begin to express how wonderful SCBWI is. From my very first regional conference (some 10 years ago) to my current role as MN Regional Advisor it has been a place of welcome and encouragement (a place for all us weird creative types who love children’s literature). The WOOP Award is just one of many ways Lin and Stephen support its members. It is such an honor to receive this recognition for my work. RAM Grant: Q.L. Pearce, Assistant RA from Orange County, for her book Red Bird Sings: the Story of Zitkala Sa, Native American Author, Musician, and Activist, from Carolrhoda Books. She plans to use the money to coordinate school visits with Native American Heritage Month in November, to make media/teaching kits to be sent to national and local museums, and to donate books to 5th grade classes at reservation schools. Since winning the RAM Grant, Q's book has several awards (including the Carter G. Woodson gold medal) and was named part of the 2013 California Collection! WOOP Grant: Alice McGinty, co-RA from Illinois, for her upper-elementary biography of Gandhi, called Gandhi: Hope of the Future. Alice has interest in the book from her editor at Houghton Miflin, but it is not yet contracted. She plans to use the grant money to travel to India to gather primary source information, and even has plans to work with Gandhi’s grandson. Q: What was the impetus for writing this book? A. I'm never sure if I choose a topic or if a topic chooses me. That said, however, I first encountered these two men while researching and writing Birmingham Sunday. I realized that the Birmingham movement owed its success to the Reverend Fred L. Shuttlesworth and that he had a perfect foil in the commissioner of Public Safety, Eugene "Bull" Connor. As I explained to my editor, it was a case of David versus Goliath, Good versus Evil, Reverend Fred Shuttlesworth versus Bull Connor. Little to nothing had been written about either man for young readers, yet they were critical players in the civil rights movement. I'm not certain how different history would have been had these two men not lived in the same place at the same time, but surely it would have been different. Q: What about the conflict between these two men helped shape our world today? A: First, you have to understand that these two men had a symbiotic relationship. Bull Connor used Fred's frequent calls for an end to segregation to get reelected to his position as commissioner of Public Safety, which put him in charge of the police and fire departments. 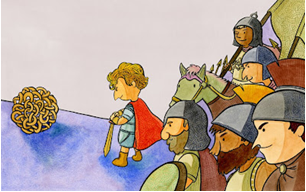 Fred used Bull's absolute demand that the races remain apart, even after segregated buses were outlawed, to coalesce a band of followers, or foot soldiers, to protest with him. The conflict-and every good story needs conflict-between the two men eventually led to the children's crusade in which Bull called out the police department's attack dogs and ordered the fire department to turn the hoses on the young protesters. This heaped worldwide embarrassment on Birmingham, and on the United States, and it forced the Kennedy administration to call for an end to the second-class treatment of this country's black citizens. Without the conflict in Birmingham-Fred's peaceful protests and Bull's violent responses to them-it likely would have taken even longer for the country to look at the problem of race relations and equality. Q: You've become somewhat of an authority on the civil rights movement. What is it that you, a white man, find so appealing about it? A: I've been asked this question many times and some have even suggested that I should leave black history to blacks and focus on my own history, and my response has been, "This is my history, too." I want to better understand what the struggle for civil rights was all about, and there is no better way to do that than by researching and writing about it. Furthermore, as a former teacher who visits schools across the country, I've been amazed by how little is taught about the struggle. It is almost as if the entire civil rights movement can be summarized in schools by the mention of two names: Reverend Martin Luther King, Jr., and Rosa Parks. Children, and even adult groups that I speak to, don't seem to understand that the movement relied largely on unknown foot soldiers who were doing the real work of planning and protest, who were on the front lines of agitation and being attacked and getting arrested time and again. The book sounds amazing, and there's lots more to that interview at Larry's website here. Arizona was founded in 1988 and has been proudly serving the region for almost 25 years. As Regional Advisor I am honored to represent the growing number of individuals who comprise our culturally diverse membership in the pursuit of excellence. We offer a wide range of opportunities for professionally published, seasoned, and pre-published writers and illustrators who actively seek to develop their craft and stay informed about the ever-changing business of the children’s and young adult marketplace. SCBWI Arizona is a large region geographically. Folks from Yuma to Lake Havasu City, Tombstone to the Grand Canyon, Tucson to Phoenix, Scottsdale, Prescott, Flagstaff, Sedona, Payson and places in between stay connected through our member Listserv and our Chapter Home at www.scbwi.org. In addition, our regional website, www.scbwi-az.org, provides members and the general public with information about upcoming events, networking opportunities, resources, member websites, and local speakers. The site also showcases members’ art and features portraits of local writers and illustrators in our chapter. SCBWI Arizona is committed to providing its members with a wide variety of high quality free and tuition-based events and services throughout the year. We have hosted our members at conferences and conventions sponsored by various organizations, including the International Reading Association, the Arizona Reading Association, the Arizona Library Association, the Tucson Festival of Books, the Arizona Humanities Council, and the Arizona Book Festival, among others. In addition to our intensives, retreats, hands-on workshops, critique-niks, networking get-togethers, discussion groups and a range of other events, we bring top industry professionals to our region at our annual conference "Welcome to Our House,” This event is especially well attended and often draws folks from all over the country. 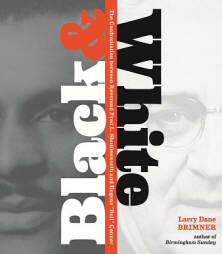 At this year’s “Welcome to Our House” Conference on October 6, 2012 in Scottsdale, we will present our member Larry Dane Brimner with the well-deserved 2012 Crystal Kite Member Choice Award for his book BLACK AND WHITE: THE CONFRONTATION BETWEEN REVEREND FRED L. SHUTTLESWORTH AND EUGENE “BULL” CONNOR (Boyds Mills Press, 2011). 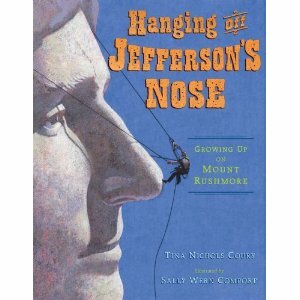 The book was also a Robert F. Sibert Honor Book, a recipient of the 2012 National Council for the Social Studies Carter G. Woodson Book Award and a winner of the 2012 Norman A. Sugarman Biography Award. Larry Dane Brimner has been a member of SCBWI since 1982. 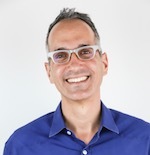 He is the author of more than 150 books for readers of all ages, ranging from humorous picture book fiction to middle-grade and YA nonfiction. His debut children's book was BMX FREESTYLE (Watts, 1987), a 1988 International Reading Association's Childrens Choice book. Since then, Larry’s books have continued to garner awards, including the Oppenheim Gold Medal for THE LITTLE WOLF (HarperCollins, 2002), the Norman A. Sugarman Biography Award and the Jane Addams Book Award for WE ARE ONE: THE STORY OF BAYARD RUSTIN (Calkins Creek, 2007) and an Orbis Pictus honor and a Jane Addams Honor for BIRMINGHAM SUNDAY (Calkins Creek, 2010). For voting in the Crystal Kite Member Choice Awards, SCBWI Arizona is grouped with Nevada, Utah, Colorado and New Mexico. The nominees for this year were all outstanding. However, it was particularly gratifying to see Larry Dane Brimner win in our division. Larry is a consummate writer and an author to emulate. SCBWI Arizona is pleased to have him as one of its distinguished members and we wish him continued success. You can find out more about Larry and his books at his website here. And discover more about SCBWI Arizona here. My thanks to Michelle and cheers to Larry for winning the Crystal Kite Member Choice Award for BLACK & WHITE: THE CONFRONTATION BETWEEN REVEREND FRED L. SHUTTLESWORTH AND EUGENE "BULL" CONNER! And thanks for the reminder that perseverance and hard work pay off! Lee: Congratulations on your book, MINE!, being awarded the Crystal Kite Members Choice Award! Patrice: Thank you, Lee. I was delighted receive the Crystal Kite from my SCBWI peers in Texas and Oklahoma. I'm humbled and honored! Patrice: MINE! 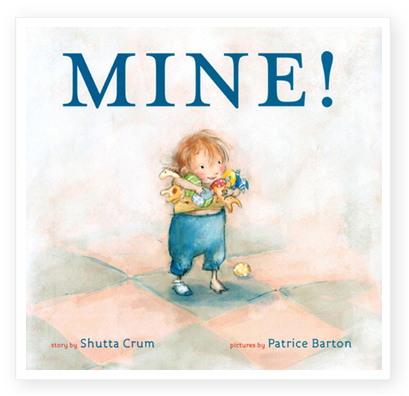 is a nearly wordless picture book about a toddler, a baby and a puppy navigating the trials and triumphs of sharing. It begins with two adults setting the children down next to a pile of toys. The toddler declares "Mine!" with every toy in reach. The baby is enthralled by the toddler and is unconcerned by his territorial claims. The puppy just wants to play. Mayhem ensues! Eventually, the dog's water dish becomes involved, one toy gets wet, the other toys get wet, the toddler, baby and dog all get soaked. Just when you think things are going to get dicey the children realize, all on their own, that toys are a lot more fun when you have friends to share them with. Lee: How long have you been involved with SCBWI? Patrice: I've been an SCBWI member for almost nine years. Lee: Can you share what you feel you've gained by being a member? Patrice: It's been great! My first experience with SCBWI was a local conference here in Austin. I didn't know a soul, I just knew I had to be there. I loved every minute of it. The guest speaker was Laurie Halse Anderson (just wow!) and the entire audience hung on her every word. I knew then that I was in the right place. I made friends that day that I still have now. I have two favorite things about SCBWI. The first is the wonderful friendships I've made over the years thru conferences and our Austin chapter meetings. Now we meet over coffee, sharing our latest "favorite" picture books. Also I'm a member of the Girllustrators, a group of SCBWI friends who share shoptalk and resources. Austin is really a great community of writers and illustrators who help and support each other. My second favorite thing about the SCBWI are the conferences I've attended in Texas and New York. 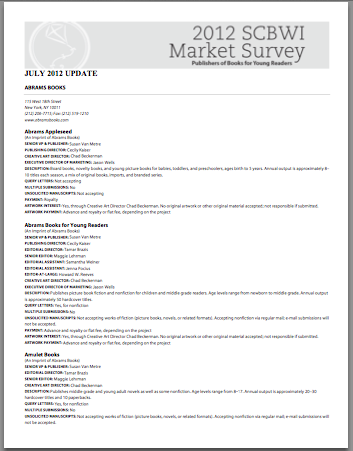 They are terrific avenues for learning about the industry, teaching you how to get your foot in the door. The keynote speakers are always inspiring! The conferences are also a great place to reach art directors, editors, agents and publishers. For example, I have a picture book in the process now with an art director I met at the last conference I attended. Lee: There you are, starrring in another SCBWI Success Story! Awesome! 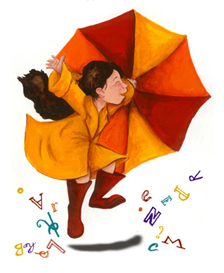 Do you have any advice to share with other children's book writers and illustrators? 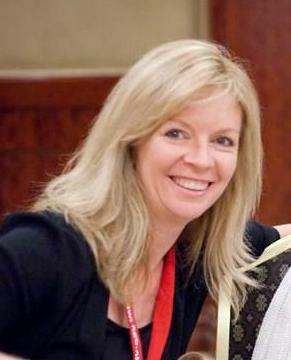 Patrice: Explore SCBWI and take advantage of all it has to offer! When it comes to your work, try everything! Enjoy! Play! Dig in! Go out on a limb! If you go too far, you can always reel it in a bit. If you don't stretch, you won't know how far you can go. SCBWI possesses a strong presence in Texas. There are five vibrant chapters in the state, each of which has its own unique charm to it. We all exchange information with one another and support each chapter’s events through promotion and participation. Of course, isn’t that the SCBWI way? The Austin Chapter always has something going on. If it’s not a monthly meeting at BookPeople, it's a celebration for a member’s book release or clusters of folks in coffee shops hunkered down over their laptops simply spending time together honing their craft. We’re lucky because our PAL members regularly attend meetings and events. They serve as models of success and a testimony of the professional opportunities provided them through membership in the SCBWI. Oftentimes these shining stars can be found greeting a newcomer, which just warms my heart! It’s as if together we grow. Speaking of working together, being that Austin is known for being such a techie city, we’ve gathered up a bunch of our local gurus and are putting together another digital event on October 6th. We’re calling it Digital Symposium II: the Nuts and Bolts of Success. It’s going to be a hands-on technology workshop for illustrators and authors of all techie levels. Be it blogging or beveling, tweeting or technique sharing, hyperlinking or hashtagging, the intention of this symposium is for the participants to leave with new skills to add to their technological tool belts. Registration is now open. Y’all come on out and enjoy a little bit of Texas hospitality! We’d love to have you. Access http://www.austinscbwi.com to register. We’ll treat you so good, you won’t want to leave. Regarding Patrice Barton’s recent Crystal Kite win, oh gosh, we’re all over-the-top elated about it! There is not a more deserving illustrator walking on the planet than Patty! She’s the consummate professional and has spent years perfecting her technique, and what a magical technique she has! She’s delightful, amazing, warm, soft-spoken and very kind. I think her mesmerizing illustrations are a reflection of her tender heart. You can’t fake the artistic sincerity of Patrice Barton’s style. No way. And, in keeping with the spirit of lifting up others, Patty’s a member of a female band of local illustrators who call themselves the Girllustrators. These ladies openly share their techniques on a beautiful group website. Also, Patty has done a series of instructive videos for our Illustrator Coordinator, Mark Mitchell, for his website and his program called How to Be a Children’s Book Illustrator. All of this, and, because of her desire to raise the level of participation and excellence within our community of illustrators, Patty rolled up her sleeves and served as a committee member during our knock-out Regional Conference last February. Can you see why we’re so thrilled for her? She’s the greatest and most deserving of this prestigious award. You can find out more about Patrice at her website here. 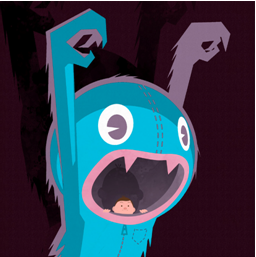 And more info on Austin SCBWI here! My thanks to Debbie, and cheers to Patrice for winning the Crystal Kite Members Choice Award for her illustrations for MINE! The 2012 Mentors are four members of the Illustration Committee: David Diaz, Priscilla Burris, Art Director and VP at Penguin Books For Young Readers Cecilia Yung and Pat Cummings, as well as VP and Publisher of Henry Holt Books For Young Readers Laura Godwin. In the spirit of the faculty's one word chosen for #la12scbwi, here is one word reflecting my experience: transformative. Amazing #LA12SCBWI conference. Heading home feeling inspired and empowered. Thank you, @scbwi! Have nearly my entire book trailer nailed down, thanks to @wilsonetienne and her workshop at #LA12SCBWI. Now I guess I nd to finish the bk! 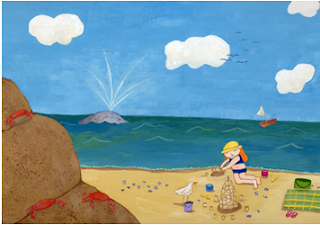 Completely revamped my website after @EllenHopkinsYA's social media workshop at #LA12SCBWI. http://www.evelynehrlich.com Thanks, Ellen! Today in a critique at #LA12SCBWI, I asked a writer what she's gotten from the conference. Her response: "Courage." My heart melts & bursts. My most important take-away from #LA12SCBWI : I can do this. Did I miss one of your favorite moments? Add it in comments! 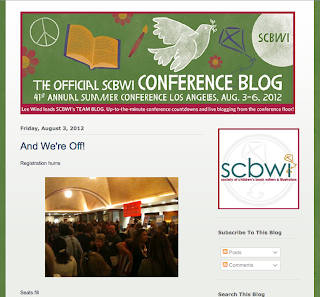 And of course, for a more in-depth look at the conference, check out The Official SCBWI Conference Blog. 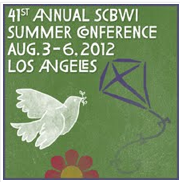 #LA12SCBWI: A Taste of the 2012 SCBWI Summer Conference! Visit The Official SCBWI Conference Blog to see highlights of the entire Summer Conference! and experience a bit of the craft, business, inspiration and community yourself! And the fun! Of course, if you attended the conference with us, you can check out sessions you missed, comment on your favorite moments, and re-live the highlights! The next SCBWI International Conference will be February 1-3, 2013 in New York City. Hope to see you there! Your Conference THRIVE-al guide: A Dozen Tips for Four Days Made Of Awesome! 1. When you get it, take the time to read your packet. There's a lot of material there, but if you wait until you get home to check it all out, you may miss some important things - be informed, and read your packet. 2. First time at the conference? Attend Jolie Stekly's Friday Morning New Attendees Orientation. It's in room Olympic 1 at 7:45am. Get up early and go to it! 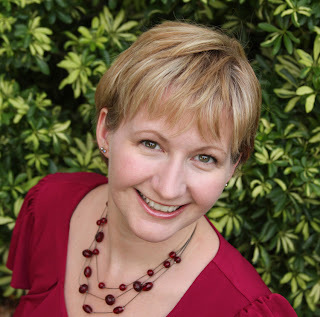 Jolie's a member of Team Blog, a former Regional Advisor, and SCBWI's 2009 Member of the Year... She's a treasure, and you'll be in good hands! "What good is sitting alone in your room? Come hear the music play..."
Don't just attend keynotes and workshops and then retreat to your room. Hang out in the lobby bar and by the outside tables - even if you don't drink. Talk to your fellow writers and illustrators... Lots of magical connections and moments happen this way. Leave yourself open to that magic! 5. Keep your nametag on. Even at dinner, or drinks afterwards (see tip #4.) Your conference name tag helps others know you're part of the tribe, and helps them remember your name, too. You can even stash some of your own business cards in the back so they're handy. 6. Speaking of business cards, when you get one, or that evening, jot a quick note to yourself about who the person was and what you discussed. It's not so much for your biographers, but there will be over 1,000 other attendees... and in a couple of months (or years), it will be remarkably useful to have something brief to jog your memory. Friday night there are a bunch of Optional activities, including: Yoga, an Illustrator Social, a Nonfiction Social, an International Social, an LGBTQ Q&A (with publisher and editor Arthur A. Levine, assistant agent Natalie Lakosil, and award-winning author Sonya Sones) and Moderated Peer Group Critiques. Saturday night there's the Hippie Hop Gala (and Dance Party!) Will YOU be wearing Tie Dye or Fringe or ...? The world of SCBWI's Summer Conference is your oyster, from sun-up to sun-down and around again to sun-up. Partake. 8. Take care of yourself and your creative fire. If you're feeling overwhelmed, it's okay to take a break (despite tip #7.) Chat with a fellow conference-goer by the pool. Sketch. Outline that new picture-book idea. Visit the conference attendee hospitality rooms - Bel-Air and Malibu (on the California Level) - to recharge and have a snack in a quiet place. Remember that this is YOUR conference, your time, and you get to make it your own. Even if you're not on twitter, you can follow along at this twitter search. 10. When tweeting or blogging the conference, remember our Team Blog guidelines... A taste but not a transcript. It is not respectful to the presenters to share their material in its entirety, so let's all be respectful. 12. Do your homework. Particularly excited to meet a certain faculty member? Read a couple of their books first (that they wrote, or illustrated, or agented, or edited), and you'll have something to talk about, and maybe questions to ask to make it a great discussion. 13. Bookmark the SCBWI Conference Blog at http://scbwiconference.blogspot.com/ to follow along and comment on the experience! Do you have MORE tips for your fellow conference-goers? Add them in comments!